This program has changed my life. I’ve always worked out, but could never get THE LAST few pounds off. This program gave me the tools to accomplish my goals. The staff is supportive and well educated. I would recommend to all people struggling to see POSITIVE results. The most important thing is how you regiment your plan. The clinic gives you the framework to work within, but it’s up to you to tailor it to how you live. One day, I stepped on the scale and realized that I weighed more than I ever had in my life, even when pregnant. None of my clothes fit and I was embarrassed to go to the gym. I had no accountability and any weight I tried to lose on my own would just come back. Having a monthly check-in has given me the accountability and progress reports that have kept me motivated. I lost almost 30 pounds faster than I thought possible and almost everyone around me noticed. I now have more energy and am the most fit I’ve been in over 10 years. Now I can say I really am in the best place of my life – inside and out! Thanks Houston Weight Loss and Lipo Center! I started this journey because I was carrying around enough extra weight that I did not even feel like myself anymore; at least not on the outside. I found myself to be at a great place in all areas of my life, but was unhappy with how I looked. I wouldn’t be photographed and I hated having to shop for clothes. From my first visit to Houston Weight Loss and Lipo Center, I knew I was at the right place. The entire staff encouraged, supported and cheered on every success. Now I can say I really am in the best place of my life – inside and out! Thanks Houston Weight Loss and Lipo Center! I look forward to a continued relationship as weight management stays a top priority! After a short time, I had already lost ten pounds! After having my first child I was struggling to lose the “baby weight,” as I like to call it. I tried on my own, eating vegetables and fruits, but nothing was really happening. The clinic is not far from home so I decided to go and see what they could do for me. It was a different approach than what I was used to (nutritionist or dietician) and I was at first not sure about taking a pill to help me lose weight. What it did for me is to make me forget I was hungry, therefore allowing me to eat smaller portions. Smaller portions became part of my everyday life and I feel I can continue on that healthy habit path by myself with much more energy than before. I was going through a real rough time in my life and I am a typical emotional eater so the pounds just kept adding on. I was tired of feeling bad about my body and I wanted my confidence back so I found Houston Weight Loss and Lipo Center online and started going through the tutorials. I figured I would give it a shot. The staff was simply the best. They are uplifting and kind. I really liked how they treat me. The weight started coming off so fast and with my very busy life it was so easy. Every month I saw progress. I’m not a health nut so the medicine they give you and just eating smarter is really all I did and people tell me all the time how great I look. I feel like my old self again, and it’s great. What made me make my first appointment was I have tried losing weight by eating less and working out. It didn’t work! That is why I decided to make an appointment with Houston Weight Loss and Lipo Center. I have lost weight and I feel much better. I get to do more things with my kids. I feel less tired and more active. I also changed my eating. After a stressful year in nursing school, I had gained about 15 pounds and I just couldn’t seem to lose it with regular diet and exercise. My goal was simple – to fit back into my “pre-nursing school” clothes. Everyone at Houston Weight Loss and Lipo really helped me reach that goal in a safe, healthy and quick way! In only a short time, I lose almost all of the 15 pounds but there have been benefits I wasn’t expecting. I started a weight-lifting regimen and I even joined a local cycling group. I highly recommend Houston Cosmetic and Weight Loss to any and all of those who are considering weight loss. I couldn’t believe that it was working! I was actually losing weight again! I made the decision to come to the weight loss clinic after losing 70 plus pounds on my own. I hadn’t reached my goal after trying every diet possible. I knew that I needed help. I became very frustrated with myself. I was working out daily and still nothing. I started to become complacent and told myself that no matter what I did, I will always be that fat girl. One day, I was sitting on the couch eating Popeye’s (as usual) and I saw a commercial and decided to come in. I was doubtful and very skeptical because I had tried everything and I couldn’t reach my goal. Once I got started, everyone was so friendly and uplifting. I had hope again. I left my first appointment so encouraged. I told my family and friends, and they were skeptical which cause me to be discouraged all over again. I still followed the meal plan that week and did everything that the doctor said to do. I couldn’t believe that it was working! I was actually losing weight again! The thing that amazed me the most was how easy it was. My skinny jeans now have extra room in them! I was turning 40 in a few months and wanted to lose weight, feel better and look better. My previous methods were exercise and Atkins Diet. I would lose then gain weight as soon as I ate any carbs. Once I started back eating carbs and keeping track of my calorie intake, it was a breeze to lose the weight. I can now wear the clothes that I’ve kept in the back of my closet. My skinny jeans now have extra room in them! I’m more confident now and people always my 19-year-old son’s sister. I am now down almost 40 pounds and I feel better than ever! I had always been the person who could eat what I wanted, when I wanted and never gain. In fact, I tried for years to simply be 100 pounds. As my thirties neared, I noticed that was not the case anymore and began on yo-yo diet after yo-yo diet, eventually pushing myself to 180 lbs. It was then I knew I needed help and support. I could no longer walk my dog without being short of breath let alone normal outdoor activities. The ladies at Houston Weight Loss and Lipo Center were very supportive and enthusiastic about my progress. I truly do not believe I could have achieved this without the staff’s and my family’s support. After moving across the country and back in less than two years, I had experienced a lot of life changes. Unfortunately, one of those changes was gaining weight. In yet another new city with no support system, but knowing I needed to make a change and needed help, I was so happy to find Houston Weight Loss and Lipo to help me jumpstart my weight loss and find ME again! My friends and family keep telling me I look amazing and have my “spark” back. I know I couldn’t or wouldn’t have done it without the assistance and accountability of the staff here. I am so thankful for Houston Weight Loss and Lipo’s guidance, professionalism, and support throughout my entire weight loss journey and I’m glad that support continues even after reaching my goal weight! I decided to make an appointment just because I needed help and guidance with trying to lose weight. I wanted someone to let me know what things I needed to take out of my diet and what foods to add to my daily meals. At first, it was hard to let go of all the favorites like fries and fried foods. It was hard to start preparing my meals for the week. After a while I got used to cooking my weekly meals. It actually saved me time and money in the process. It didn’t take long for me to start noticing my shirts feeling more comfortable, having more energy at the gym, and craving “healthy” food. I wasn’t craving the old fried foods. Weight management is important to achieving my goals just because it makes me a little more responsible for what I put into my body. Portion control is also a great way to maintain my weight. The staff has been great in helping me in my journey. I can honestly say that they truly care about their patients. They didn’t make me feel awkward because I am a male – as it’s mostly women that have problems with their weight. So I would recommend everyone, men and women to get a kick start in their weight loss journey. It pays off in the end. What amazed me the most was the way that I have been responsible for my eating habits. I cannot blame anyone else but myself, if I choose to eat unhealthy. Houston Weight Loss and Lipo Center gave me the tools to maintain a healthy lifestyle. If your weight is compromising or hindering your health, I would not wait to check this place out! Before seeking out Houston Weight Loss and Lipo Center, I reached a peak weight of over 200 pounds, which was considered heavily obese, as I was only 5’1″ tall. I developed a deep vein thrombosis (blood clot) that put me in a wheelchair for roughly three months, during which time I lost an enormous amount of muscle and gained over 50 pounds. I was having an incredibly difficult time shedding the weight, simply because I could not exercise without pulling muscles, and all the various diets and supplements I tried were unrealistic to adhere to. I decided to turn to Houston Weight Loss and Lipo Center because I felt I needed medical help to drop the weight. Not too long after starting the program, I had dropped 10 pounds, and soon after that, over 20 pounds. It became easier to walk! While pulling muscles was still a problem, it was mentally reassuring to know that as I dropped the weight, I was putting less tension on my joints and muscles, giving them a chance to heal and build. All my friends and family, who were all concerned for my health, were very supportive and instantly took notice of the weight loss. It wasn’t long before I had lost over 30 pounds with minimal exercise. My mind was blown by how effective the appetite suppressant was. Prior to the DVT, I was a fitness instructor, and even teaching eight or more hours a week, trying to lose even five pounds was a nightmare. The staff gives you articles to read to help maintain your weight loss through difficult times like Christmas or Thanksgiving, and the appetite suppressant works very well. It allows you to put in your body the food you want without losing any energy. I’ve lost 60 pounds much faster than I had anticipated! I have so much more confidence and abilities back in my life. I can dance and hike again, and photo time or clothes shopping has become enjoyable! I still have 25 pounds to lose, and I’m confident that with the help of Houston Weight Loss and Lipo Center, I will achieve my full weight loss goal of 86 pounds. My cousin is a patient of Houston Weight Loss and Lipo Center. After seeing her lose weight, I decided to make an appointment. I now feel great! My blood pressure decreased and I’m doing more outdoor activities because I have more energy. My boyfriend started to notice a difference after I lost 20 pounds, and my mom noticed that my clothes were fitting loosely. Everyone is so proud of my weight loss! The staff at Houston Weight Loss and Lipo Center is nice and they’ve been great throughout everything. They told me what to do, step-by-step. I’m shocked because I didn’t think I would ever look like this again. I feel awesome, great, and happy and my self-esteem is much better! I decided I had to change. 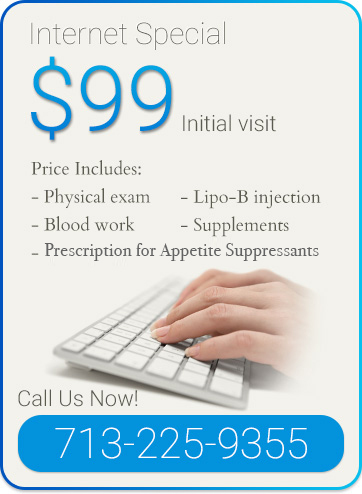 I found Houston Weight Loss and Lipo Center by searching on the Internet and I made my first appointment. My mom and grandmother have high blood pressure and high cholesterol. I didn’t want that for myself. Now that I’ve lost 43 pounds, my mom is now exercising and eating healthy. My family and friends are so proud of me and even I have a hard time believing I lost so much weight! I feel awesome and I’m so happy that I now have to shop for new clothes! I really recommend Houston Weight Loss and Lipo Center– it has changed my life! I tell them there’s no secret, just eat healthier portions, exercise every day and drink a lot of water! It’s not hard to lose weight; it’s about having the right mindset. When you start to see that you’re losing the weight, it motivates you to push forward. You learn how to love yourself! I decided to come to this clinic because I was recommended by a family member who lost weight. I always tried to diet, but never had a good result. I never thought I could lose this much weight! The best lesson I have learned is how to eat healthy. Before I came to Houston Weight Loss and Lipo Center I didn’t have energy to do anything. When you start to see that you’re losing the weight, it motivates you to push forward. You learn how to love yourself! Then when your family and friends start to notice the difference, your self-esteem increases even more! When I first came to Houston Weight Loss and Lipo Center my weight was considered to be obese. Let me just say I have tried everything to lose weight because I was so frustrated. One day, I was just looking online and found Houston Weight Loss and Lipo Center. I was looking for help to lose weight. I decided to give them a try. Since I have been going to Houston Weight Loss and Lipo Center I have lost 19 pounds. They have helped me accomplish what I have been trying to do for years. I am so grateful to everyone at the clinic. Every time I have gone to the center for an appointment everyone is so nice and really do care. They have always answered all of my questions no matter how stupid I thought they were. The staff was incredibly nice and encouraged me to come in for a visit. When I first began the weight loss program I had almost resigned myself to being overweight the rest of my life. Somehow I decided I would give it one last try and began searching the Internet for yet another “program.” It seemed like I had tried them all. Houston Weight Loss and Lipo Center kept coming up and so I decided to call. The staff was incredibly nice and encouraged me to come in for a visit. I did and met Dorothy, the clinic’s nurse practitioner. I can honestly 29 pounds later that the medical and support staff have been as beneficial as the program. I felt supported from the first visit. I have struggled with a weight problem my entire adult life. I have found the combination of diet supplements and liquid meal substitution (from time to time) has been incredibly effective. Dorothy spends time every visit going over helpful information and is always ready with a smile and encouraging word. The food/eating plan works. The support is incredible. What more could you want? I have lost 19 pounds and I’m still going! I feel great with more physical stamina and mental focus, and I have regained my sense of hopefulness and self-confidence. The medication gives me the control to eat well and avoid the wrong kinds of foods. After countless approaches to manage my worsening weight problem, I was ready to have surgery in my mid-40s. At 311 lbs my energy level was zero, exercise was nearly impossible, and my eating habits fluctuated from a determined health regimen to an indifferent pattern of consuming whatever was at hand. I came across Houston Weight Loss and Lipo Center clinic on the web and figured one last-ditch effort was worth the possibility of avoiding an operation. Once I began to see results with Phentermine, I was encouraged and more determined to reach my goal of 200 lbs. What an unbelievable rush to say I have about 25 lbs left to lose. I fit into clothes that I thought would be donated or thrown away. In fact, some of my old clothes are now too large and I was so glad to put them in the charity bin. At my new size, I can exercise now, I feel great with more physical stamina and mental focus, and I have regained my sense of hopefulness and self-confidence. The medication gives me the control to eat well and avoid the wrong kinds of foods. You can’t believe how good mornings are without the donut cravings that made the car steer itself toward the coffee shop. If you’re reading this and feel similarly discouraged about weight loss failure, you need to call and experience the success that can help you arrive where I have! Thank you for the difference you’ve made in my life. I pray God’s blessings upon you. I weighted over 200 pounds. I felt like the fat lady at the circus. I was very depressed. My first consultation was a great experience. The staff was very warm and friendly. Nurse practitioner Dorothy Nelson was highly informative and presented the weight loss program in an educated, well thought out manner. It became evident that she was highly knowledgeable in this area. An immediate rapport and trust developed. I lost 16 pounds very quickly and an additional 25 soon after. All the while Ms. Nelson continued to educate, inform and encourage. I enjoy losing weight just to come here and see her smile!! My experience here has been fabulous! Such an incredible staff, all of whom are friendly, helpful and encouraging. As of December 14, 2007 I have lost 51.5 pounds. My friends and coworkers are amazed. I proudly tell them of the excellent care and education I receive. It’s been a great experience for me at Houston Weight Loss and Lipo Center. I couldn’t imagine I could lose so much weight and I’m not done yet! Each appointment just makes me more determined and encouraged. I started my weight reduction with Dr Bergeron not long ago and as of today I have lost 58 pounds! I feel great. I am no longer taking blood pressure medication and most importantly I am healthier than I have been in years! I considered lap band surgery but found Houston Weight Loss and Lipo Center online and decided to give it a try before surgery as my option. I am glad I found this program, it has changed my life and probably extended it as well. The medication program gave me the extra “willpower” I needed, while the education modules gave me “tools” to work with on a monthly basis. It really has made the weight loss easy as well as taught me how to eat healthier. The staff at the Clinic has been outstanding! Sometimes I think they are more excited for my weight loss than I am! I feel I have lost weight the right way, steady, methodically and with support. That is why I know I will never be grossly obese again! Thanks to you all, the staff, for your support and encouragement. 58 pounds and counting! I’m not done yet!